The Thermo Scientific Value Lab Upright Freezer offers you everyday laboratory storage, with adjustable control, and great stability. This Thermo Freezer is insulated with foamed in place polyurethane and uses CFC-free R134a Refrigerant. The interior of this 20 Cu ft freezer has an enameled steel interior and exterior that corrosion resistant. The temperature range of this lab freezer −12° to −20°C and is adjustable through a mechanical thermostat set just inside the door. The Thermo Scientific Value Lab Upright Freezer has a bottom mounted compressor and requires 3 inches of clearance on all sides from optimal performance. This upright freezer has fixed height shelving, and 6 indoor shelving for plenty of storage space. Unit is a Brand New Scratch & Dent Model that's been tested with a clean bill of health by our service team as part of our QC inspection. 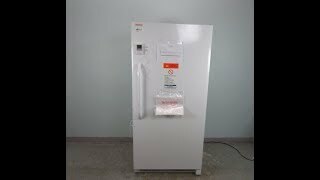 This Thermo Scientific Value Lab Upright Freezer is a Brand New Scratch & Dent Model that's been tested with a clean bill of health by our service team as part of our QC inspection. All of our lab equipment comes backed with our standard warranty. Should you have any questions, please don't hesitate to contact us.